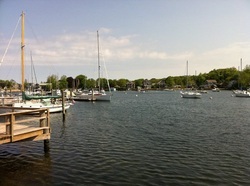 The Phusion Grille is an upscale dining establishment on historic Eel Pond in the beautiful Woods Hole, MA. Phusion Grille is owned and operated by seasoned restaurateur Carol Grigas.She strives to provide her patrons with not just a meal but an experience. This is done with the help of her very knowledgeable kitchen staff, coordinated by Executive Chef Kory Ferrier. The dishes served are very unique and eclectic, there is something for everyone on the menu including vegan dishes, vegetarian and even gluten free. The food is inspired by flavors from around the world expertly prepared fresh daily. The Phusion Grille is not just a restaurant, it's experience. An experience you have been looking for, and will never forget.